Advanced Peptide Growth Factor, or APGF, is composed of carefully screened advanced peptides and high concentrations of lyophilized human-derived growth factors, that deliver flawless skin restoration that is safe and effective. Call to order this product. (508) 505-4878. 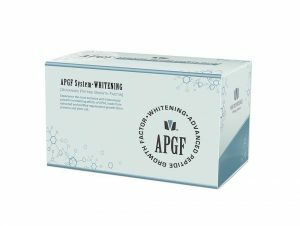 APGF solution is the only topical solution on the market that has the ability to stabilize human and plant derived stem cells to be infused into the skin during the microneedling process. 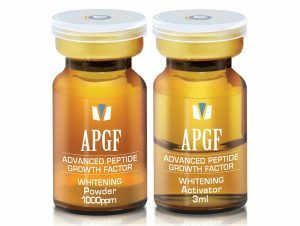 The active ingredients in APGF solution help to restore healthy natural cellular functions in the skin. APGF solution is also biologically compatible to human DNA. 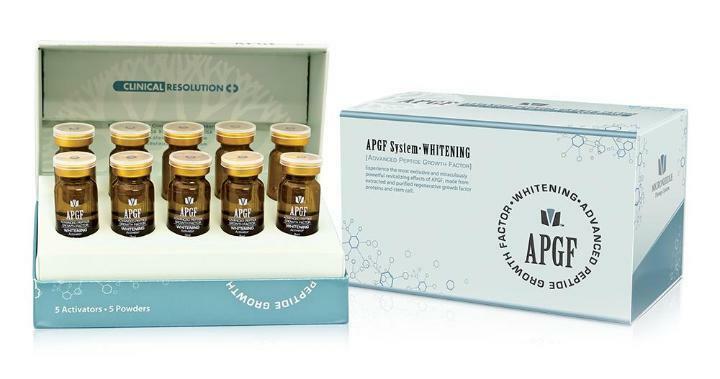 APGF Anti-Aging contains Caffeoyl Tripeptide-1, Caffeoyl-sh-Octapeptide-4, Vitis Vinifera (Grape) Vine Extract, peptides and growth factors for diminishing all signs of aging. APGF Solution for Whitening contains niacinamide, resveratrol, and plant stem cells to help inhibit melanin production, as well as a blend of human-derived growth factors & peptides to promote healthy skin. *Please note: As a student of Doctor Lance Setterfield, Pro Skin Guru does not recommend using anything other than sterile saline solution during rolling or needing, and the Hyaluronic Acid of your choice on the skin for 24 hours post-needling in order to minimize complications that can occur from needling serums into the skin. All claims made regarding these solutions are those of Clinical Resolutions Lab and are not those of Pro Skin Guru, Rilevi Enterprieses, LLC, Jennifer Buker, or any employee of these entities. You should rely on your own training when determining what product to use (or not to use) during needling treatments. Pro Skin Guru is not affiliated with Dr. Lance Setterfield or www.needlingguide.com in any way. I have just personally taken this training, which has helped me to feel much more qualified to avoid any of the complications that can occur without proper training.